Hundreds of people who volunteered their services for Big Dance earlier in 2012, one of the highlights of the London 2012 Festival, have been honoured through The Queen’s Diamond Jubilee Volunteering Award 2012, acknowledging their fantastic efforts throughout the summer. 60 awards selected by Her Majesty The Queen were announced, with a formal event to be held at Buckingham Palace in spring 2013. 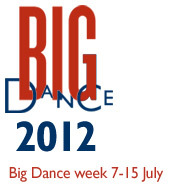 Big Dance held over 3,500 events across England, Northern Ireland, Scotland and Wales, reaching approximately four million people, and encouraging dancers and non-dancers alike up and down Great Britain to don their dancing shoes and get involved with such an enormous event. Big Dance included television programmes, performances and events in the streets and public spaces, in theatres and schools, and in the heart of communities across the UK. Some of the UK’s leading choreographers and dance artists created work for Big Dance, including Wayne McGregor CBE, who created an Olympic-inspired dance routine aimed at schools and performed by thousands of children and young people around the world. In light of the recent parliamentary discussions surrounding the place of dance in the curriculum, this is clear evidence of the encompassing nature of dance and what it is able to produce. The Big Dance 2012 volunteers were essential in producing a successful and uplifting experience for all involved, in helping to run events, organising publicity, providing transport, making costumes, and all of the other things needed to complete large-scale community events, especially as part of such a huge scheme. People of all ages and backgrounds volunteered, with organisers receiving overwhelming responses of enthusiasm and positive interest. Many have developed skills as a result of the summer of 2012, such as those in event management, marketing, and administration, having been great ambassadors for dance and community celebrations.